Bumper to Bumper (Episode) – From SpongePedia, the biggest SpongeBob-wiki in the world! Next Episode: Eek, an Urchin! 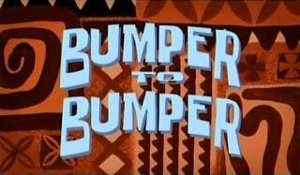 Bumper to Bumper is an episode from Season 9. One fish is doing the boating course perfectly with Mrs. Puff, and then its SpongeBob's turn. Mrs. Puff gets very angry at SpongeBob after he fails the test again. Soon, Mrs. Puff realizes SpongeBob is afraid of the course and has him drive on an abandoned road where he passes his test and gets a license. Near the end, SpongeBob drives out of the road and freaks out. SpongeBob gets back on a road, but is on a highway and is he gripped with fear. And police had seen them and thought they were reckless drivers because Mrs. Puff crossed the county line which she shoudn't have done. At the end the police officer rips up SpongeBob's license. As Mrs. Puff goes to jail, she says she'll get SpongeBob. The car is the same as Grandma SquarePants' car, but left hand drive. This page was last modified on 22 May 2018, at 05:45. This page has been accessed 9,072 times.